I’d been planning to put Resistance out in India for a while, and barely noticed the last year pass in the middle of the five other things I’ve been working on across media. Still haven’t figured out who the best publisher is for the print edition, and the movie rights shenanigans cause additional complications, but the US/UK versions of Resistance have been out for many months now, and I thought that I should put it up on Kindle at least, because that at least doesn’t move slowly. Everyone who’s asked for the Indian edition, or expressed dissatisfaction about it being out internationally first, apologies for the delay, and thank you for your patience. The response I’ve received for these books abroad has been beyond my wildest expectations. Turbulence also hit no.1 on Indian bestseller lists in the early days of its publication, so I’m really curious and excited about how this little bundle of Internet data is going to do on its own now. So, here we go. Cover is from the Indian hardback of Turbulence, by Sarnath Banerjee. 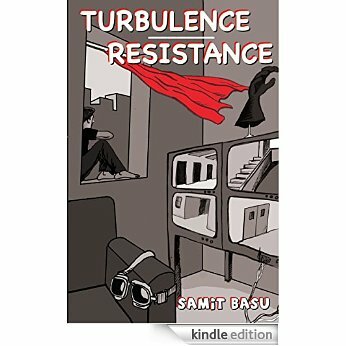 In case you need additional stimulus to buy, the book pages of Turbulence and Resistance, with excerpts, interviews, posts, videos and many, many really kind reviews from across the world, are here and here. If this Kindle edition does well, it’ll be because you told your friends and Internet followers about it. I’m most curious to see how this experiment works. But it will only work if you share it, or RT, or post, about it. So please do. re-uploaded after that. other people have said it works fine.